Molly Powell The Secrets to My Success Volume 1 Building Confidence in Your Turns. Great advice from one of the living legends of barrel racing. 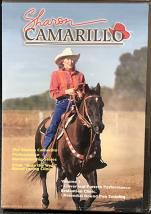 For over twenty years Molly Powell has claimed all the prestigious titles in the barrel racing world. Here she teaches you how to build confidence in your turns with a step by step training guide. TheHorseStudio.com review: Entertaining and informative. This Horse DVD brings a myriad of generously shared tips for the more advanced racer as well as an opportunity for the neophyte racer to learn from the best from the beginning. Molly Powell is one of the most engaging folks around and the DVD was enjoyable as well as educational. You can see why Molly has been at the top of the sport so consistently with so many different horses and why turn after turn she is found at the pay window! Recommended. NTSC North America and Canada. English language.